The Prism Sound Titan is a USB multi-track audio interface for personal recording and sound production, for professional musicians, songwriters, engineers and producers as well as recording studios, post production facilities and scoring stages. 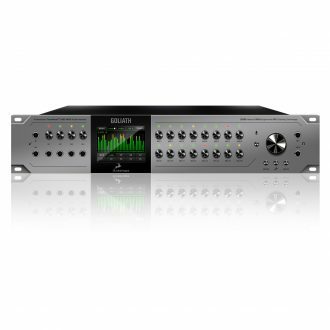 Titan is ideal for music and sound recording, multitracking, overdubbing, stem-based mastering, analogue summing and critical listening applications. 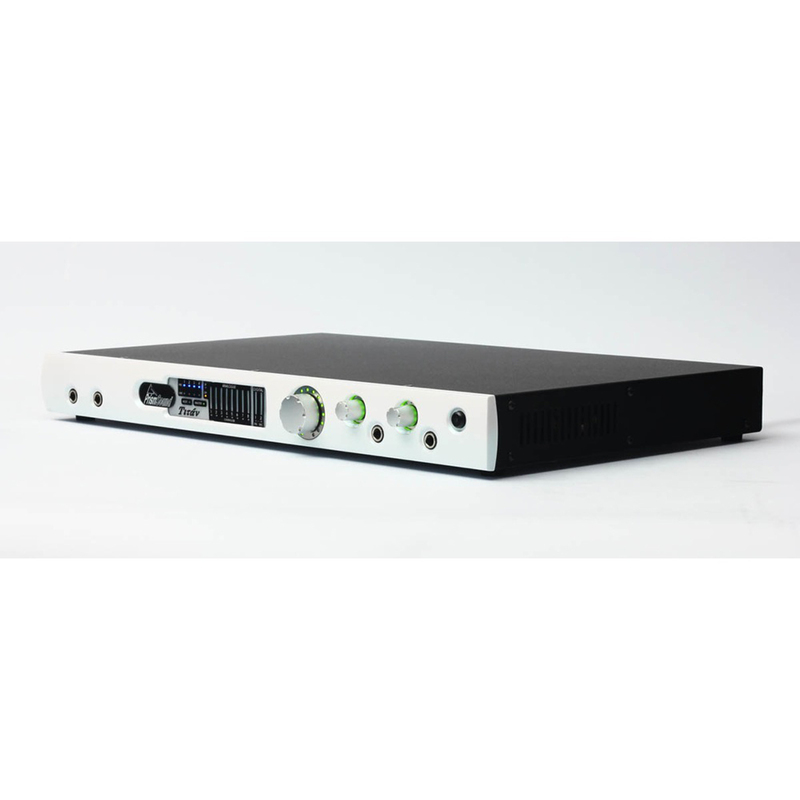 Titan provides Prism Sound’s renowned performance, sound quality and state-of-the-art clock technology in a dedicated unit compatible with both Windows (Vista, 7 and 8, 32 and 64 bit, ASIO as well as MAC OS X 10.4.11 and later (Intel). Once configured with a computer, Titan can also operate stand-alone using its S/PDIF or AES3 I/O. Eight analogue input channels and up to 10 digital input channels are available as inputs for your audio workstation software through the host computer’s audio driver. Similarly, eight analogue output channels, up to 10 digital output channels and stereo headphone outputs can play 20 different channels. For low-latency foldback or monitoring to headphones or main outputs, each output pair (1-2, 3-4 etc or the headphone output) can optionally be driven from the built-in DSP mixer with an individual local mix of any selection of inputs through the controller applet. All analogue inputs are electronically balanced with automatic unbalanced operation. Analogue outputs are electronically balanced with ‘bootstrapping’, i.e. level is maintained if one leg is grounded. The Prism Sound Titan USB Audio Interface makes no compromises on audio quality. It is the result of years of research and development into digital audio conversion and extensive dialogue with Prism Sound’s customers. The Prism Sound Titan USB Audio Interface draws on Prism Sound’s years of experience in developing digital audio products, including its range of audio test equipment, adopted by a wide variety of clients across the audio industry from pro-audio to consumer electronics. This experience means that Titan is well-behaved both as a computer peripheral and an audio processor. Reliability is vitally important in professional recording. Prism Sound has always made extensive use of precise software calibration techniques in its converters – pots and tweaks are always unreliable, so there are none. The design team has gone to great lengths to minimise noise and interference, in particular hum. All of the analogue circuits have galvanic isolation, while the unit’s electronically balanced I/O allows it to handle common mode interference sources as well as enabling trouble-free connection to unbalanced equipment. It is often said that THD+N figures do not always correlate well with the perception of sound quality and this is true – partly because the traditional measures of THD+N or SINAD expressed as RMS figures are rather a broad measure. With this in mind, we have taken great care to make sure that not only is the Titan noise and distortion spectrum beyond reproach, but the RMS distortion result measures up to the state of the art. The Prism Sound Titan USB Audio Interface is easy to connect to your computer and to your outboard gear. For both Mac and PC platforms, there is a controller application to configure the unit and control its built-in mixer and other functions. Aside from the monitor and headphone level controls, everything else is operated solely from the Titan controller application. The controller software opens on-screen as a separate panel alongside your existing editing software. The Prism Sound Titan USB Audio Interface’s eight analogue inputs support various capabilities. Titan has four really good mic amps with software-controlled gain in 1dB steps, individually-switchable phantom power – and very low noise and distortion. 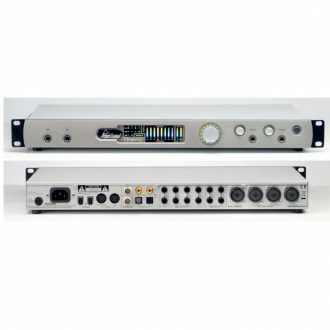 These inputs are auto-sensing, and support microphone and line input, with digitally-controlled mic gain in excess of 60dB. Two of these inputs also support direct injection (DI) instrument connections with quarter-inch jacks on the front panel. RIAA Equalization can be selected in the controller applet on channels 1 & 2 so that turntables can be connected for archiving or sampling applications. By selecting the input type (Mic or DI) , low- or high-impedance cartridges can be loaded with suitable termination impedances. All analogue inputs have individually-selectable Prism Sound “Overkillers” built in, just as on the higher-priced ADA-8XR, to catch those fast transients. The Overkiller threshold automatically follows the operating line-up level selection (+4dBu or -10dBV). Overkillers are ideal for percussive sounds, particularly drums, where headroom can be a problem. The Prism Sound Titan USB Audio Interface can also operate in a stand-alone mode using its ADAT or co-axial digital I/O connections. Once set up using the Titan controller applet, the unit can be disconnected from the host computer and used independently. Titan will retain its settings when powered down so even if it is switched off, Titan can be re-powered and stand-alone operation can continue with the automatically-stored settings. Our customers also identified a need for a unit that could provide low latency foldback to performers, particularly when tracking and overdubbing. 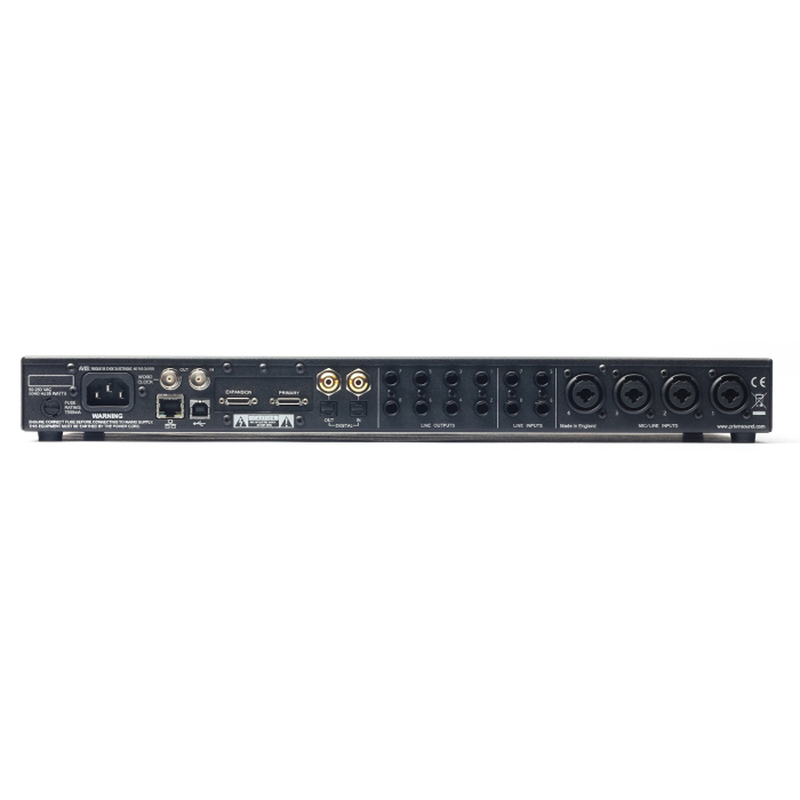 In answer to this need, The Prism Sound Titan USB Audio Interface has a powerful built-in digital mixer that can be configured from the host computer to provide foldback feeds to performers, each with their own stereo mix of workstation playback and any of the inputs. The question of latency in computer interfaces, especially USB and FireWire boxes, is an important one. Obviously there are situations where the round-trip latency needs to be really short, like in overdubbing. The problem is that even if the latency on the interface and in the driver is as short as it could ever be, a native DAW is busy with plug-ins and other software and buffer times are probably set long. The only answer is to provide local foldback mixing in the interface. This is not new, and other products feature it, but most local mixers in competitive products are just too basic. The Prism Sound Titan USB Audio Interface provides ‘console quality’ local mixing – every output has its own independent mixer, with channel strips for all inputs and workstation feeds, complete with fader, pan/balance pot, solo and mute buttons, and full metering. Strips can be stereo or mono, and the mixes are dithered with filtered coefficients, just as in a top-end digital mixer. 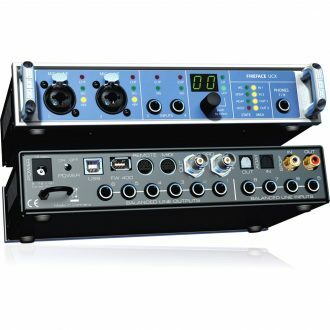 Although the unit’s outputs will mainly be used for monitoring or foldback, the fact that they are of such high quality makes them suitable for a range of other applications such as insertion points, analogue summing or stem-based mastering. As well as wanting great analogue recording channels, the DAW user also needs top-quality monitoring. 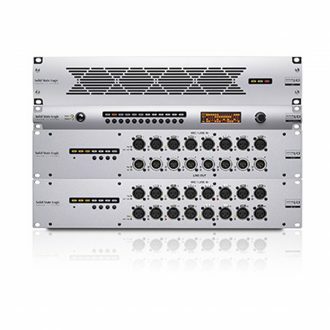 The eight analogue outputs on Titan allow monitor setups from multi-stereo up to 7.1 surround. 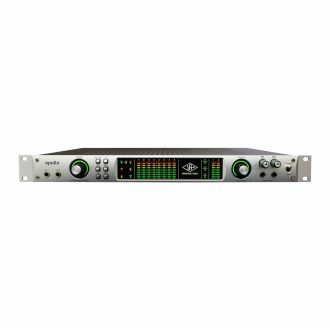 The Prism Sound Titan USB Audio Interface has a real volume knob which can be assigned to any or all of the analogue or digital outputs for use as a control room monitor control. There are two headphone amps, suitable for all types of headphones, each with its own independent volume control. As well as having its own workstation feed and mixer, the headphones can also be quickly switched across the other output pairs, which is handy for setting up. 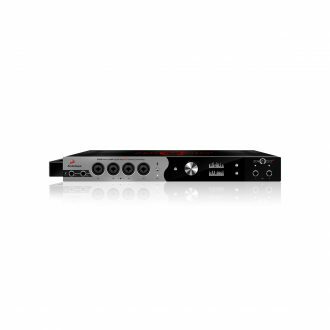 The digital output is equipped with the four Prism Sound SNS noise-shaping curves and includes Prism Sound’s renowned synchronous sample-rate conversion, allowing outputs to various external devices at other sampling rates. 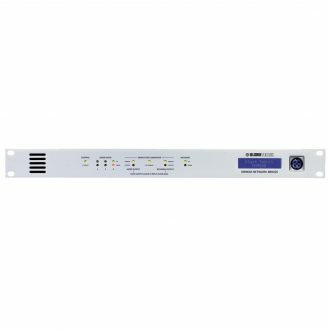 The sample-rate converter can be used at the outputs as well as the inputs, so as well as dealing with unsynchronised or wrong-rate digital inputs, Titan can also generate, say, a live 44.1kHz output from a 96kHz session. Since Titan also includes the full suite of the famous Prism Sound ‘SNS’ noise shapers, you can also reduce to 16-bits at mastering-house quality. In the 1990s Prism Sound pioneered testing of sampling and interface jitter and as a result our digital audio products deliver unsurpassed jitter rejection. Prism Sound digital audio products lock up fast and re-generate ultra-stable clock outputs. Another aspect of the traditional Prism Sound converter that is retained was the clocking – it’s just as important as analogue-path considerations sound-wise. So whether it’s providing a high-quality master clock for the rest of the room, or dealing with a jittery clock from outside, Titan is as rock-steady as its forbears. 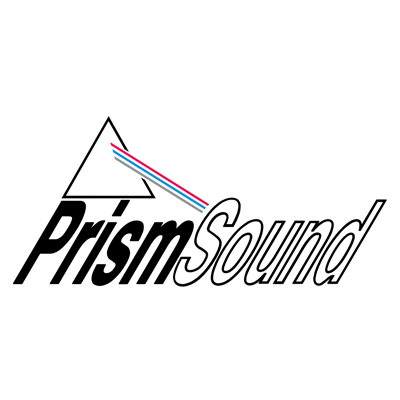 Over the years, Prism Sound’s reputation for audio quality has been matched by its reputation for after-sales support and technical advice. Titan has the benefit of that support and customers have access to one of the best technical teams in the business. 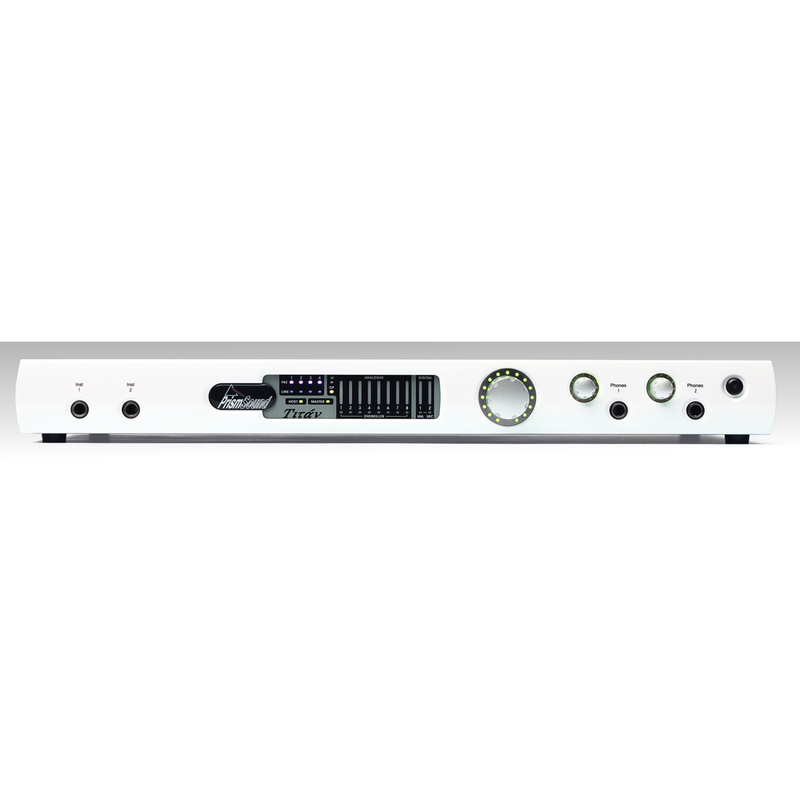 We believe that Titan delivers exactly what our personal studio customers have asked for – all the performance of a Prism Sound product in a dedicated USB unit that handles line, microphone and instrument inputs with good foldback and monitoring capabilities, yet at a more accessible price tag. We are confident that customers using the new Titan converter will agree that it sounds as good as it looks. - Control Panel applet: Graphical user interface for control of single or multiple Titan units under Mac OS X or Windows. 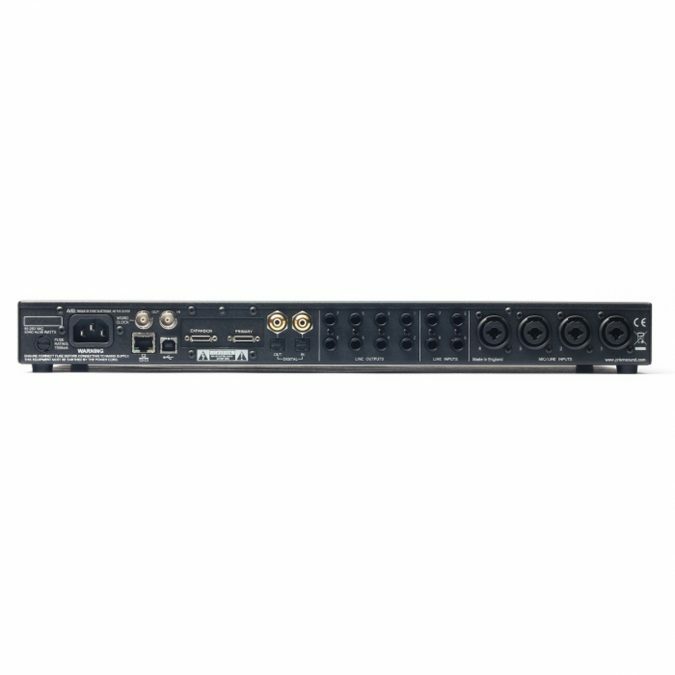 Orpheus is a FireWire multi-track audio interface for with 8 channels of analogue input and output as well as digital I/O and sync.